Students create an original animal based on the information studied. 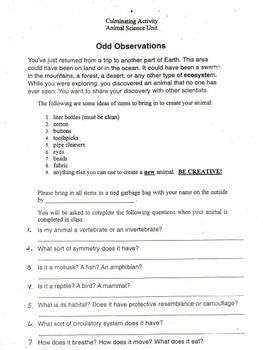 After they create their animal they answer questions about it based on information studied (describe the type of animal, symmetry, classification, habitat, etc), write a paragraph (or more) about their animal, and present their project to the class. There is a rubric the use for grading. Can be used for homework, classwork, cooperative learning, buddy work. Rose Zeidell This work is licensed under a Creative Commons Attribution 3.0 Unported License.